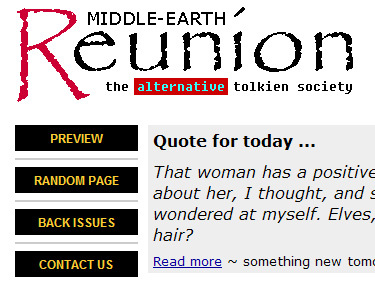 The website of Middle-earth Reunion: the alternative tolkien society presents my own creative output between 1996 and 2005, together with that of other members of MeR. These were published in the society's quarterly journal Reunion: the Journal of Middle-earth Studies and newsletter Parish's Garden, electronic copies of which remain available online. The original site (Arda Online at Parish's Garden) was completely revamped in favour of the cleaner scheme shown here. The new site was launched in 2001. The layout is structured using html tables. No content management system was employed and it is unlikely I will ever now rework the design given the large number of pages (in excess of 500).